Classical Extreme value laws have been recently found for orbits of dynamical systems. The theory has been devised for a special class of observables which allow for a link between the concept of extremes and the lack of Poincare recurrences around a chosen point of the phase space. My contributions in this fields of research are directed towards the understanding of the relation between the recurrences and the extreme events , the nite time behavior of asymptotic laws [1,2,4,5] and the generalizations of theoretical aspects to physically meaningful systems [6,8,10,11,13,18]. The understanding of the mechanism regulating the transitions between di erent attracting states in complex systems is a general problem in statistical mechanics. Systems which feature such transitions range from spin glasses up to climate systems, ecosystems and finance . I have been involved in developing rigorous statistical methods for detecting the transition thresholds in datasets [3,12,17] and in the modeling of systems at bifurcation points via the so called ARMA (Auto Regressive Moving Average) processes technique . Providing a statistical description of turbulence, by combining theoretical findings with high quality experimental datasets, is helping in understanding several features of turbulent flows as the dissipation anomaly or the existence of singularities in the Navier Stokes equations . I am actually contributing to this research field by developing statistical techniques based on the Extreme Value Theory and the ARMA process analysis which allows for quantify the distance between observations and theoretical models in a rich model-parameter space . Davide Faranda, Valerio Lucarini, Giorgio Turchetti, and Sandro Vaienti. Numerical convergence of the block-maxima approach to the generalized extreme value distribution. Journal of Statistical Physics, 145(5):1156-1180, 2011. Davide Faranda, Valerio Lucarini, Giorgio Turchetti, and Sandro Vaienti. Generalized extreme value distribution parameters as dynamical indicators of stability. International Journal of Bifurcation and Chaos, 22(11):1250276, 2012. Valerio Lucarini, Davide Faranda, and Matteo Willeit. Bistable systems with stochastic noise: virtues and limits of effective one-dimensional langevin equations. Nonlinear Process. Geophys, 19:9-22, 2012. Valerio Lucarini, Davide Faranda, Giorgio Turchetti, and Sandro Vaienti. Extreme value theory for singular measures. Chaos, 22(2):023135, 2012. Davide Faranda, Martin Federico Mestre, and Giorgio Turchetti. Analysis of round off errors with reversibility test as a dynamical indicator. International Journal of Bifurcation and Chaos, 22(09):1250215, 2012. Valerio Lucarini, Davide Faranda, and Jeroen Wouters. Universal behaviour of extreme value statistics for selected observables of dynamical systems. Journal of Statistical Physics, 147(1):63-73, 2012. Valerio Lucarini, Tobias Kuna, Jeroen Wouters, and Davide Faranda. Relevance of sampling schemes in light of Ruelle's linear response theory. Nonlinearity, 25(5):1311, 2012. Davide Faranda, Jorge Milhazes Freitas, Valerio Lucarini, Giorgio Turchetti, and Sandro Vaienti. Extreme value statistics for dynamical systems with noise. Nonlinearity, 26(9):2597, 2013. Davide Faranda and Sandro Vaienti. A recurrence-based technique for detecting genuine extremes in instrumental temperature records. Geophysical Research Letters, 40:1-5, 2013. Davide Faranda and Sandro Vaienti. Extreme value laws for dynamical systems under observational noise. Physica D: Nonlinear Phenomena, 280:86-94, 2014. Davide Faranda, Valerio Lucarini, Paul Manneville, and Jeroen Wouters. On using extreme values to detect global stability thresholds in multi-stable systems: The case of transitional plane couette flow. Chaos, Solitons & Fractals, 64:26-35, 2014. Valerio Lucarini, Davide Faranda, Jeroen Wouters, and Tobias Kuna. Towards a general theory of extremes for observables of chaotic dynamical systems. Journal of statistical physics, 154(3):723-750, 2014. Davide Faranda, Flavio Maria Emanuele Pons, Berengere Dubrulle, Francois Daviaud, Brice Saint-Michel, Eric Herbert, and Pierre-Philippe Cortet. Modelling and analysis of turbulent datasets using auto regressive moving average processes. Physics of Fluids (1994-present), 26(10):105101, 2014. Davide Faranda, Berengere Dubrulle, and Flavio Maria Emanuele Pons. Statistical early-warning indicators based on autoregressive moving-average models. Journal of Physics A: Mathematical and Theoretical, 47(25):252001, 2014. Davide Faranda, Mickael Bourgoin, Sophie Miralles, Philippe Odier, Jean-Franois Pinton, Nicolas Plihon, Francois Daviaud, and Berengere Dubrulle. Robust estimate of dynamo thresholds in the von Karman sodium experiment using the extreme value theory. New Journal of Physics, 16(8):083001, 2014. Davide Faranda, Xavier Leoncini, and Sandro Vaienti. Mixing properties in the advection of passive tracers via recurrences and extreme value theory. Physical Review E, 89(5):052901, 2014. Davide Faranda, Berengere Dubrulle, Francois Daviaud, and Flavio Maria Emanuele Pons. Probing turbulence intermittency via autoregressive moving-average models. Physical Review E, 90(6):061001, 2014. Davide Faranda, Jorge Milhazes Freitas, Pierre Guiraud, and Sandro Vaienti. Sampling local propertiesof attractors via extreme value theory. Chaos Solitons and Fractals, 74:55-66, 2015. Martin Mihelich, Davide Faranda, Berengere Dubrulle, and Didier Paillard. Statistical optimization for passive scalar transport: maximum entropy production vs maximum kolmogorov-sinay entropy. Non linear Processes in Geophysics, 22, 187-196, 2015. Davide Faranda, Flavio Maria Emanuele Pons, Eugenio Giachino, Sandro Vaienti, and Berengere Dubrulle. Early warnings indicators of financial crises via auto regressive moving average models. Communications in non-linear sciences and numerical simulations, 29(1-3) 233-239, 2015. Denis Kuzzay, Davide Faranda and Berengere Dubrulle. Global and local energy dissipation in turbulent von Karman flow. Physics of Fluids, 27-075105, 2015. Davide Faranda, Giacomo Masato, Nicholas Moloney, Yuzuru Sato, Berengere Dubrulle, Francois Daviaud, and Pascal Yiou. The switching between zonal and blocked mid-latitude atmospheric circulation from a dynamical systems perspective. Climate Dynamics, 1-13, 2015. Davide Faranda, Jorge Milhazes Freitas, Pierre Guiraud, and Sandro Vaienti. Extreme value theory for piecewise contracting maps with noise. Stochastics and Dynamics, 16(3), 1660015, 2016. Valerio Lucarini, Davide Faranda, Ana Cristina Gomes Monteiro Moreira de Freitas,Jorge Miguel Milhazes de Freitas, Mark Holland, Tobias Kuna, Matthew Nicol, Mike Todd, Sandro Vaienti. 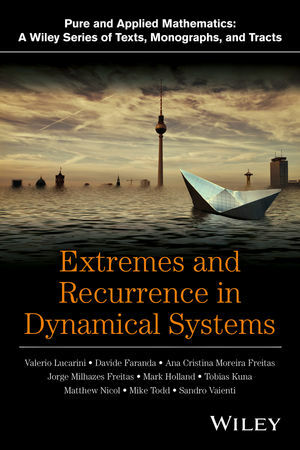 Book: Extremes and Recurrence in Dynamical Systems. ISBN 978-1-118-63219-2, 312 pages, Wiley, 2016. Davide Faranda, Carmen Alvarez-Castro, Pascal Yiou: Robust Return Times of hot and cold days via recurrences and extreme value theory. Climate Dynamics, 1-13, 2016. Davide Faranda and Dimitri Defrance: A wavelet-based-approach to detect climate change on the coherent and turbulent component of the atmospheric circulation. Earth System Dynamics, 7 517-523, 2016. Davide Faranda, Jorge Milhazes Freitas, Pierre Guiraud, and Sandro Vaienti. Statistical Properties of Random Dynamical Systems with Contracting Direction. Journal of Physics A, 49-204001, 2016. Ewe-Wei Saw, Denis Kuzzay, Davide Faranda, Alex Guittonneau, Francois Daviaud, Cecile Wiertel-Gasquet, Vincent Padilla, Berengere Dubrulle. Experimental characterization of extreme events of inertial dissipation in a turbulent swirling flow. Nature Communications, 7, 12466, 2016. Davide Faranda, Gabriele Messori and Pascal Yiou. Dynamical proxies of North Atlantic predictability and extremes. Scientific Reports, 7-41278, 2017. Emmanuel Virot, Davide Faranda, Xavier Amandolese, Pascal Hemon. Chaotic dynamics of flags from recurring values of flapping moent. International Journal of Bifurcation and Chaos, 27-02, 2017. Gabriele Messori, Rodrigo Caballero and Davide Faranda. A Dynamical Systems Approach to Studying Mid-Latitude Weather Extremes. Geophysical Research Letters, GL0728879, 2017. Denis Kuzzay, Ewe-Wei Saw, Fabio Martins, Davide Faranda, Jean-Marc Foucaut, Francois Daviaud and Berengere Dubrulle. New criteria to detect singularities in experimental incompressible flows. Nonlinearity, 30(2381), 2017. Davide Faranda, Martin Mihelich and Berengere Dubrulle. A Non equilibrium Ising model of Turbulence. Phase Transitions, 2017. Davide Faranda, Yuzuru Sato, Brice Saint-Michel, Cecile Wiertel-Gasquet, Vincent Padilla, Berengere Dubrulle, & Francois Daviaud. Stochastic chaos in a turbulent swirling flow. Physical review letters, 119, 014502, 2017. Guillaume Nevo, Nikki Vercauteren, Amandine Kaiser, Berengere Dubrulle, Davide Faranda. A statistical-mechanical approach to study the hydrodynamic stability of stably stratified atmospheric boundary layer. Physical Review Fluids, 2, 084603, 2017. Davide Faranda, Gabriele Messori, M. Carmen Alvarez-Castro, Pascal Yiou, Dynamical properties and extremes of Northern Hemisphere climate fields over the past 60 years, Nonlin. Processes Geophys., 24, 713-725, 2017. Martin Mihelich, Berengere Dubrulle, Didier Paillard, Davide Faranda, Quentin Kral. Maximum Kolmogorov-Sinai entropy vs minimum mixing time in Markov chains. Journal of Statistical Physics, 170(1), 62-68, 2018. Gabriele Messori, Rodrigo Caballero, Freddy Bouchet, Davide Faranda, Richard Grotjahn, Nili Harnik, Steve Jewson, Joaquim G. Pinto, Gwendal Rivière, Tim Woollings, Pascal Yiou. An interdisciplinary approach to the study of extreme weather events: large-scale atmospheric controls and insights from dynamical systems theory and statistical mechanics. Bulletin of the American Meteorological Society, 2018. Carmen Alvarez-Castro, Davide Faranda and Pascal Yiou. Atmospheric dynamics leading to West-European heatwaves since 1871. Complexity, Article ID 2494509, 2018. David Rodrigues, M Carmen Alvarez-Castro, Gabriele Messori, Pascal Yiou, Yoann Robin, Davide Faranda. Dynamical properties of the North Atlantic atmospheric circulation in the past 150 years in CMIP5 models and the 20CRvc2 reanalysis. Journal of Climate, 1-18, 2018. Davide Faranda, Valerio Lembo, Francois Daviaud and Berengere Dubrulle. Computation and characterization of local sub-filter-scale energy transfers in atmospheric flows. Journal of Atmospheric Sciences, 1-12, 2018. Davide Faranda, Hamza Goudi, Pierre Guiraud, Sandro Vaienti. Synchronization and Extreme Value Theory for coupled map lattices. Nonlinearity, 31(7), 3326 2018. Paul Debue, Denis Kuzzay, Davide Faranda, Ewe-Wey Saw, Francois Daviaud, Berengere Dubrulle. Dissipation, intermittency and singularities. Physical Review E, 97-053101, 2018. Katerina Giamalaki, Claudie Beaulieu, Davide Faranda , Stephanie Henson, Simon Josey, Adrian Martin. Mechanisms triggering the 1976-77 regime shift in the North Pacific revealed by dynamical analysis. Journal of Geophysical Research - Oceans, 123 4388-4397, 2018. Claire Waelbroeck, Sylvain Pichat, Evelyn Böhm, Bryan C. Lougheed, Davide Faranda, Mathieu Vrac, Lise Missiaen, Natalia Vazquez Riveiros, Pierre Burckel, Jörg Lippold, Helge W. Arz, Trond Dokken, François Thil, and Arnaud Dapoigny. Relative timing of precipitation and ocean circulation changes in the western equatorial Atlantic over the last 45kyr. Climate of the past 14, 1315-1330, 2018. Davide Faranda, Gabriele Messori, Stéphane Vannitsem. Attractor dimension of time-averaged climate observables: insights from a low-order ocean-atmosphere model. Tellus A,(71)1-11,2019. Davide Faranda, Berengere Podvin, Anne Sergent. Reconciling embedding theorems and Proper Orthogonal Decomposition via the Rayleigh-Bénard convection. Chaos, 29-033110, 2O19. M. Carmen, Alvarez-Castro, D Faranda, T Noël, P Yiou. Recurrence Spectra of European Temperature in Historical Climate Simulations. Atmosphere, 10-166, 2019. Théophile Caby, Davide Faranda, Giorgio Mantica, Sandro Vaienti, Pascal Yiou. Generalized dimensions, large deviations and the distribution of rare events. Submitted to Physica D, 2019. Davide Faranda, Gabriele Messori, Pascal Yiou. Diagnosing concurrent drivers of weather extremes: application to hot and cold days in North America. Submitted to Climate Dynamics, 2019. Sandro Vaienti, Theophile Caby, Davide Faranda, Pascal Yiou. On the computation of the extremal index for time series. Submitted to Journal of Statistical Physics, 2019. Flavio Maria Emanuele Pons, Gabriele Messori, M Carmen Alvarez-Castro, Davide Faranda. Sampling hyperspheres via extreme value theory: implications for measuring attractor dimensions. Submitted to Journal of Statistical Physics, 2019. Climate Dynamics, Dynamical Systems, Turbulence. Extreme weather events, Singularities in Navier Stokes equations, Financial Crises. Research Fellow (CDD). Grant director: Dr. Pascal Yiou. flow. Study of the weather analogues with techniques of dynamical systems. Post-doctoral research grant director: Dr. Berengere Dubrulle. -Reasearch activities: Turbulence data modeling and analysis (see below for more details). 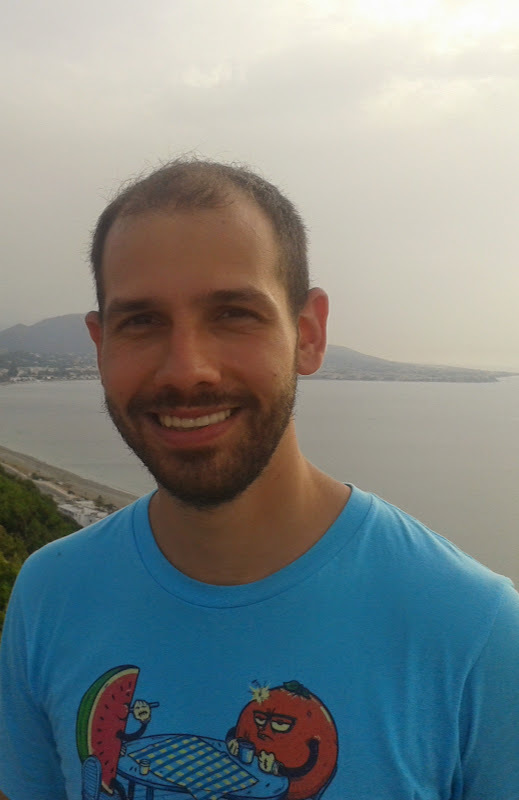 Post-doctoral Research grant director: Prof. Valerio Lucarini. -Research activities: Statistical Mechanics, Fluid Dynamics (see below for more details). Seminars and conferences planning and organizations. Students supporting via individual and group lectures. University open days organization and promotion of teaching activities. -2018 European Geoscience Union Nonlinear Processes Division Outstanding Early Career Scientists Award. -2014 Distinguished citizen of the year of the town S.Agata Militello (Italy). Prize assigned under the patronage of the Ministry of Home affairs. -2013 Selected for participating in the 1st Heidelberg Laureate Forum: a one-week event combining scientific, social and outreach activities featuring the winners of the awards in Mathematics and Computer Science, the Abel Prize, the Fields Medal (including the Nevanlinna Prize), and the ACM Turing Award, September . -2012 Winner of a sponsorship within the HPC-Europa2: Pan-European Research Infrastructure for High Performance Computing which covered a two months visit to LadHyX (Ecole Polytechnique, Palaiseau, France) to collaborate with the Dr. P. Manneville and an amount of 50.000 CPU hours to perform simulations on fluid dynamic systems on CINES-GENCI facilities located in Montpellier, France. -Elected member of the LSCE laboratory council. -Organiser of the bimestrial inter-laboratory seminars “Climate and Statistical Mechanics”, between the laboratories SPEC & LSCE at CEA Saclay, France. Cooking, classical music, building-bricks design. * Last available date depends on the NCEP and GFS updates. File provided "As is". Please cite [30,38] for research use. Thanks to M Carmen Alvarez Castro for providing the R code.